Don’t you just hate that phrase: it’s so simple, even my grandmother can understand it? She called for people to write in about important scientists who just happened to be grandmothers, or vice versa. Maria Goeppert-Mayer, the first American woman to receive the Nobel Prize in Physics, generated a newspaper headline that read, “S.D. Mother Wins Nobel Prize.” She worked as a volunteer because, since her husband was a university professor, she could not get a university job. Eve Sprunt, a geophysicist, showed up for a job interview wearing her infant son in a front baby pack and announced, “This is the question you are not supposed to ask.” The interviewer invited her whole family for an on-site interview, babysitting provided. 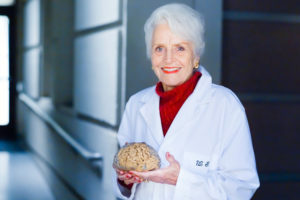 Neuroscientist Marian Diamond studied Einstein’s brain. But when she had arrived as the first female student in the anatomy department at UC Berkeley, years earlier, the first thing she was asked to do was to sew a cover for a large magnifying machine. Ursula Franklin was a metallurgist who pioneered the field of archeometry, the science of dating archeologically discovered metals and ceramics. Her research about levels of radioactive strontium in baby teeth factored heavily into the U.S decision to ban nuclear tests. When Franklin had a baby, in 1955, the committee at the research institution where she worked never managed to make a decision about what she could, or could not do. “The unpreparedness, administratively and legally, to recognize that women, when you employ them, have needs, and require an administrative framework that takes that into account was totally absent. So that the task, then, for women like myself who were feminists, was to know that you had to have laws that gave maternity leave; you had to have provisions for flexible work; and the struggle from there on was not for us, but was struggled for all women to have decent working conditions and safe wages.